It was my last full day in Hawaii and I had so much unfinished business still. I think if I had another two weeks on Oahu I still wouldn't get to everything I had in mind. I decided to go after Puu Kalena, the second-highest summit on the island. I had read up on two routes - Hobbs Ridge and Star Trek - that could be combined in a loop going over Kalena. The trailhead is the same as that I'd used two years earlier for Ka'ala, the island highpoint. The TH is located at the end of the drivable portion of Wai'anae Valley Rd on Oahu's west side. 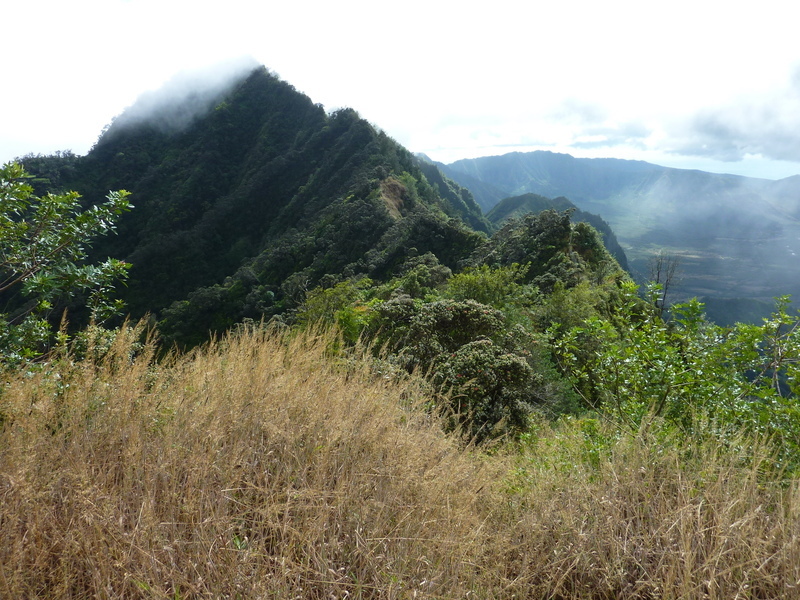 The trails are located in the Wai'anae Kai Forest Reserve, open to hunting as well as hiking. There are numerous trails throughout the forest, some marked by colored bottle caps and spray paint, others unmarked at all. I had once again made an approximate route track for the GPSr based on someone's screenshot, so it had some non-trivial margin of error. I started up the gated road on foot, heading north but looking for a side trail forking to the right. I found it within about 50yds, marked by colorful bottle caps nailed to a tree. The trail leads around a residence here to pick up an old road behind the property which serves as a trail. I did well for about an hour, following it across a nice stream and through lovely forest on a good trail heading towards Star Trek (I'm curious how that name came about, but have no idea). I began deviating from the GPSr but didn't really get too concerned. I eventually ended up on the ridge rising to the crest between Wai'anae Valley and the Naval Reserve to the south, still thinking I was Ok, following the Yellow Trail up past the base of some cliffs and then to a trashy hunter's camp on the ridge. The trail enters the military lands beyond the camp, before starting down the other side. I only followed it a short distance before deciding it wasn't taking me where I wanted to go and went back. I spent the next 45min or so wandering the trail system in search of Star Trek, but never found it. I did find some old stone walls and stone steps that rival those of Yosemite, but nothing that looked like the trail I wanted. It seems both it and the Hobbs Ridge Trail are completely unmarked. I followed yellow and blue trails across the Forest Reserve on a traversing route at about 1,500ft. Eventually I connected with Hobbs Ridge, figuring I'd go up that way instead. I so no flaggings or obvious signs of a trail, but after some searching I just started up through a clearing under the forest cover. After some time a trail of sorts became more distinct, giving me confidence I was on the correct path. And so I was. I don't know if the route was ever flagged, but there was none now. The trail was quite overgrown but still distinct enough to follow. Higher up the first of about 7-8 webbing handlines appears - it was nice that these weren't removed. Some of the sections were steep and/or slick and the handlines proved most useful. The ridge narrows considerably, less than 2ft across at one point with 40-50ft drops off either side. Once I reached the crest of the Wai'anae Range, things got a little easier. Ka'ala rises about a mile to the north, Kalena about half that distance to the southeast. A pig fence has been erected along the crest making a convenient safety rail to hold on to while negotiating the ridgline. There are a few breaks in the fence and a small notch to negotiate, but there are handlines where needed and nothing too tricky. The day had started with clear skies over the range but the clouds had moved in late in the morning and were now obstructing views and raining lightly on me from time to time. I reached the summit of Kalena shortly after noon, a bit more than 3.5hrs with my extra detours. I took what pictures I could before the clouds moved in again. There was a small grassy clearing at the top but with everything wet I couldn't even sit down. I downed some Gatorade and started back. The return went smoothly up until the time I got back to where I had started up Hobbs Ridge earlier. I didn't want to repeat the extra mileage I'd put in to get there, so looked for a trail heading down. I found one, marked by white bottle caps and merrily headed down the ridge thinking I was done. It led to some sort of water diversion intake thingy (I wasn't doing a close engineering analysis, so I'm not really sure what it was) before just petering out. Crap. I checked the GPSr and found I was only 1/4mi from the old road I had started out on. I spent about 20min bushwhacking through head-high cane grass with uneven ground underneath that I could only judge by feel. Kinda fun, actually.